Advanced Broken Bones & Fracture Care to Get You Back to Routine! Using your arms and wrists to catch yourself is a natural reaction when you fall forward or backward. In some instances, falls can result in fractures (broken bones). After a fracture occurs, you need to visit an orthopedic specialist immediately to set the broken bones or bone properly. 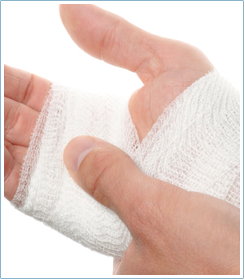 At Montgomery Medical Clinic, we cater to individuals with all types of broken bones in Gaithersburg, MD. From stress fractures to compound fractures, there’s nothing that our team hasn’t seen or repaired before. You can also count on us for complete, personalized sprain care. Your skeleton is composed of bones, many of which protect your organs. Did you know that you’re born with 270 soft bones? The number decreases to 206 as you grow older, as some fuse together over time. As well, bones harden over time and become more rigid. When your bone is forced beyond the breaking point, it fractures. In some instances, the bone may not fracture the entire way through, while in other cases, bones can actually shatter. The severity of the break is based on the force. Typically, a fracture occurs when the force on the bone exceeds the bone’s strength.